In debate, Hillary Clinton speaks of “Trump Effect” in K–12 schools. Hillary Clinton says the “Trump Effect” leads to bullying in K–12 schools. How should teachers respond? 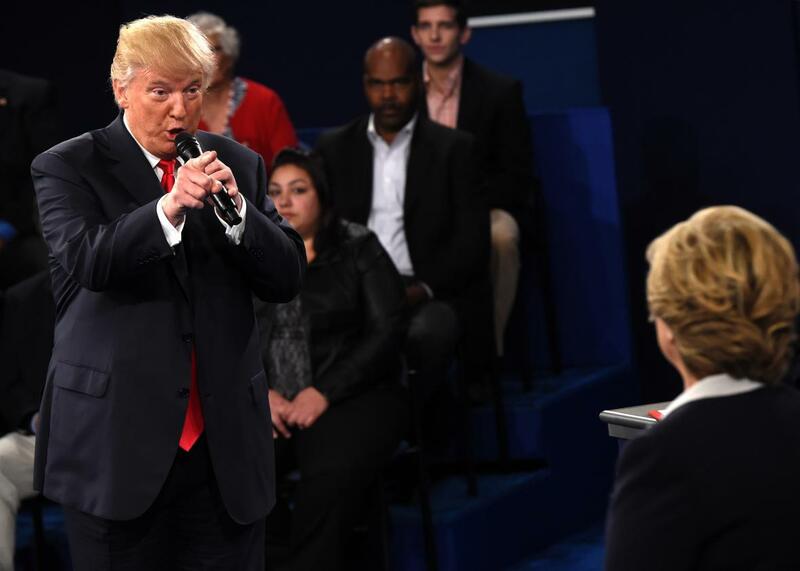 Donald Trump gestures at Hillary Clinton during Sunday night’s debate in St. Louis. Is the “Trump effect” real? And if so, how should educators respond to it? It was the Southern Poverty Law Center that popularized the idea of a Trump effect. In April, SPLC released a survey of 2,000 K–12 teachers. More than half of them responded “yes” when asked whether they had heard “an increase in uncivil political discourse at [their] school since the 2016 presidential campaign began.” Two-thirds of the surveyed teachers agreed with the statement, “My students have expressed concern about what might happen to them or their families after the election.” One-third observed an increase in anti-Muslim or anti-immigrant sentiment. Many teachers in the SPLC survey said they had directly addressed Trump’s rhetoric with their students, and sometimes put it into historical context—discussing Japanese internment, the Holocaust, or debating whether the Constitution would allow a President Trump to enact his various policy proposals, such as mass deportation and an anti-Muslim religious test for new immigrants. Jonathan Gold, a middle school history teacher in Rhode Island, wrote a thoughtful essay recently on the dilemma many educators face. “[W]hile I want my students to think for themselves, I also want them to learn to resist destructive ideologies,” he stated. He suggested that teachers put the 2016 election in historical context, asking students to read primary source documents and then discuss why George Washington was skeptical of political parties, or how the 1848 Seneca Falls declaration on women’s rights remains relevant today. “I’m not worried about appearing biased if my stance is against bigotry and in defense of moral reason and the scholarly use of evidence, logic, and research,” Gold wrote. Gold, however, teaches at a private Quaker school. Public school teachers, particularly those without tenure, may be more hesitant to bring up the election with students whose parents do not share their political leanings—no matter how pedagogically sound their lessons are. In the meantime, we’ll be hearing more about the Trump effect. An ad from MoveOn highlights Trump-related bullying, such as a high school in Oregon that was vandalized with a banner reading “Build a Wall” and one in Indiana where student basketball fans chanted “Donald Trump” at players of color from an opposing school. The nation’s largest teachers union, the National Education Association, is supporting Clinton with a digital ad buy and direct mail campaign focused on the Trump effect.